A few days ago a scientific paper was published entitled “Psychotic Experiences in the General Population.” The authors used surveys of 32,161 respondents in which they were asked questions such as the questions below (my sources for these questions are here and here). The first thing is seeing a vision – that is, seeing something that other people who were there could not see. Did you ever see a vision that other people could not see? The second thing is hearing voices that other people could not hear. I don't mean having good hearing, but rather hearing things that other people said did not exist, like strange voices coming from inside your head talking to you or about you, or voices coming out of the air when there was no one around. Did you ever hear voices in this way? The authors used positive answers to questions like these, and classified them all as “psychotic experiences.” Although I have never had an experience of hearing a mysterious voice or seeing a vision, I regard such an approach as ludicrous. The approach is unwise because a significant fraction of people who have such experiences are probably not mentally sick in any way. Some of these experiences may be called paranormal experiences. Others may be called spiritual experiences. Others may be telepathic experiences. But according to the misguided approach of these authors, all such people are simply psychotics. So imagine you, like countless other normal people in human history, happen to report seeing a ghost. According to these authors, you're simply a psychotic. Or suppose you are tempted to do some very wicked thing, and when you are just about to do it, you suddenly hear a mysterious deep commanding voice saying: repent and follow the righteous path. According to these authors, you're simply a psycho. Or imagine you see something strange in the sky, something that looks like a UFO, and you point it out to your friend, but before he can look at it, it's gone. According to these authors, you're simply a psycho. Or imagine you leave your child in the bath to answer the phone, and then suddenly hear a voice from nowhere saying: go check your child right now! You check, and find your child had almost drowned. According to these authors, you're simply a psycho. Or imagine you engage in mysticism, prayer or meditation, and after much practice you find yourself seeming to reach beyond your normal everyday reality and contact some numinous transcendent external intelligence who seems to say to you: yes, yes, I am here. According to these authors, you're simply a psycho. Or imagine you (like many other people) have some near-death experience in which you have a vision of some “being of light” or some vision of a deceased relative. According to these authors, you're simply a psycho. There are a variety of different hypothetical reasons why a person might see something that other people don't see or hear something other people don't hear, including the following. They might be hearing a voice from God. They might be hearing a voice from some angel. They might be hearing a voice from some deceased spirit. They might be seeing some ghost or some vision of an angel or departed spirit. They might be hearing some voice that originates from some other living human, through something like ESP or telepathy. They might seem to hear some voice coming from some aspect of their own consciousness. Their own conscience might “send a message” in a way that resembles a voice. They might be having some rare spiritual or psychic experience that awakens some rarely-waked part or functionality in their own mind. They might be seeing something or hearing something because of a long-term mental disease. Psychotic experiences were typically infrequent, with 32.2% of the respondents with lifetime PEs reporting only 1 episode... An additional 31.8% of respondents with lifetime PEs experienced only 2 to 5 PE episodes. Thus, for nearly two-thirds of respondents (64.0%) with lifetime PEs, these experiences occurred only 1 to 5 times in their lives. So a large fraction (32%) of those who reported hearing an unexplained voice or seeing some “vision” experienced such a thing only once in their life. That's not what happens when you have a real psychosis such as schizophrenia, which involves having hallucinations again and again. There is no known type of brain-disorder psychosis that causes a once-in-a-lifetime hallucination. The paranormal literature contains countless examples of perfectly normal people who have one-shot experiences of hearing voices, often offering one-time messages of comfort or warning. There are many cases like one I recently read in a book by John Geiger. A boy found himself on the 16th floor of a burning hotel, with his exit blocked. Suddenly he heard a voice telling him to stick his head out the window and look down. He did that, and saw that 2 floors down was a balcony he could jump to. There are also countless accounts of people who heard a voice or saw a vision of a deceased relative. Such experiences are the proper business of organizations like the Society for Psychical Research, not the American Psychiatric Association. What we have in this study is an example of pathologizing the spiritual and pathologizing the paranormal. Things paranormal, inexplicable or deeply spiritual are treated as if they were a symptom of a psychiatric disorder. It's another blunder in a field that has been marred by many serious blunders (although it has no doubt done lots of good work). For decades psychiatry was overshadowed by the dubious theories of Sigmund Freud. Countless patients shelled out fortunes to psychiatrists who engaged with them in long psychoanalysis treatments that might drag on for years. Such treatments were based on very shaky theories of repression and the subconscious. Later many psychiatrists got all enthusiatic about lobotomies as a treatment. Many patients had important parts of their brains severed in the belief that this would improve their well-being. For most of the 20th century, psychiatric handbooks listed homosexuality as a mental disorder. Nowadays psychiatry seems to be doing better, although it still seems way too entangled with the pharmaceutical industry, as discussed here. Why would psychiatrists want to list a wide variety of spiritual or paranormal experiences as “psychotic experiences”? Well, for one thing, such a confusion is highly profitable. The more human experiences are classified as psychotic, the more business for psychiatrists. Rather than "jumping the gun" by using presumptuous and judgmental terms such as "hallucinations" and "psychotic experiences" to describe anomalous experiences, it would be better for psychiatrists to use neutral, objective terms such as "anomalous auditory experiences" or "anomalous visual experiences" (except in the case of something that seems utterly preposterous and outside of any known belief system, like a person reporting that his dog is talking to him). Walter: I have three things I don't understand. The first is why my legs seem so fit for the purpose of running. The second is why my eyes are so very fit for the purpose of seeing. The third is why my hands are very fit for the purpose of picking things up. Could you help me explain these things? Naturalist: I have a single coherent explanation for all of these things, We can explain your legs using the principle of natural selection, by assuming that they evolved because they gave your ancestors better survival values, because fast runners can better escape predators. We can explain your eyes by also using the principle of natural selection, by assuming that they evolved because they gave your ancestors better sight, because organisms can see better and find food faster and spot predators faster. We can explain your hands by also using this same principle of natural selection, by assuming that they evolved because they gave your ancestors the ability to pluck berries and fruit better. Now in terms of coherence, the naturalist has done a good job here. He has offered a single principle that explains all three of Walter's questions. But let us suppose that this naturalist encounters a different young man with a much larger set of questions, a man named David. The conversation might go something like this. David: I have some things I don't understand, and I wondered if you can help me explain them. Naturalist: Certainly, I would be glad to help. David: My first question is: why did the universe suddenly begin about 13 billion years ago, in the event known as the Big Bang? David: Very well. My second question: why does the universe have all of these fundamental constants that seem to conspire in such an astonishing way to make the universe habitable? It seems that the chance of all these “anthropic coincidences” occurring by chance is incredibly small. For example, they say the cosmological constant seems fine-tuned to 60 decimal places. Naturalist: Well, uh...it could be that there are 1,000,000,000,000,000,000,000,000 universes, a vast multiverse of trillions of quadrillions of quintillions of universes, and if there were something like that, we might expect that one of them might just coincidentally have the physics and fundamental constants needed for intelligent life to exist. David: I see. Now another thing I would like help in understanding is: how could life and the genetic code have originated billions of years ago? For you to have even the simplest starting point of life, you need some very advanced things like a genetic code and self-reproducing molecules. Don't tell me that natural selection caused that, because you needed to have this starting point before biological natural selection could even begin. Naturalist: Well, we can simply imagine that there was an incredibly lucky combination of chemicals that produced these things --- kind of like throwing a box of scrabble letters up in the air many times, and one time having them spell out a coherent message. David: I see. But there's another “origin” question I'm interested in: the origin of man's higher consciousness. It seems that man has lots of things that don't really do him much good from a “survival of the fittest” standpoint – things like spirituality, mathematical reasoning, self-consciousness, an “inner stream of experience,” aesthetic appreciation and creativity, morality, altruism, and so forth. How could man have got all these things? Don't tell me it was just natural selection, because most of these things don't help people survive until they reproduce. Naturalist: Well, we can simply imagine that lots of these things are just incidental side-effects of neuron activity – kind of like the gravy produced incidentally when you cook a turkey. David: I see. I am also puzzled by the evidence for psychic phenomena – things like ESP and remote viewing. There have been lots of experiments offering strong evidence for ESP. Naturalist: No, that cannot exist, so we must explain that by assuming things like math errors and fraud. Naturalist: Those must just be hallucinations – a set of people who are coincidentally having similar hallucinations. David: I see. But there's something else I would like help explaining. There are people called mediums who claim to be able to communicate with dead people. I have heard that some are fake, but it seems that some of them seemed to produce very paranormal results, and stood up very well to investigation. I'm talking about people like Daniel Dunglas Home, Leonora Piper, and Gladys Osborne Leonard. Naturalist: No one survives death, so there must be some other explanation. Maybe they hypnotized people into believing they were achieving paranormal results. David: I see. I would also like some help in explaining the very puzzling research on reincarnation done by Stevenson, that psychiatrist. He spent most of his life gathering countless reports of children who said they were reincarnated, and he found corroborating evidence in very many cases. Naturalist: That cannot be real, so it must be something like fraud, hallucinations, or conspiracies. David: I see. I have only two things left that I need explaining. The second-to-last thing I would like an explanation for is apparition sightings. Why have so many people said they saw ghosts or apparitions? Naturalist: That cannot be real, so that must also be caused by hallucinations. David: Hallucinations again? Aren't you over-using that as an explanation? Naturalist: Okay, so I heard someone suggest that apparitions may be caused by mold spores, so let me suggest that as an explanation. David: Very well. There's one last thing I need help explaining. Why have sometimes people reported miraculous cures or paranormal premonitions or unexplained voices of warning, or seemingly miraculous phenomena observed by multiple witnesses? Naturalist: I would suggest explanations such as lies, coincidence, optical illusions, and mass hysteria. David: So let me try to summarize your answers. The explanations you are suggesting for these things I needed help explaining include (1) the universe popped into existence out of nothing; (2) there's also a vast collection of a billion trillion gazillion unobserved universes; (3) life and a genetic code suddenly originated from chemicals, by lucky combinations, like long messages forming from tossed scrabble blocks; (4) our higher mental features arose just as a kind of incidental by-product, like gravy from a cooking turkey; (5) there were math errors, different types of hallucinations, and lots of coincidences that misled people; (6) people got hypnotized by psychics; (7) there were lies, optical illusions, and mass hysteria; (8) there was fraud by investigators, or conspiracies; (9) and finally … mold spores. Naturalist: Yes, that pretty much covers it. Now, what nouns best describe the weird, motley assortment of explanations suggested by the naturalist to explain David's items? Another good noun is: hodgepodge. We might also describe it by calling it an incoherent jumble. The set of explanations offered by the naturalist in response to David's questions is incoherent and jumbled in the sense that it doesn't stick together. Instead of having some common theme or unified thread, the naturalist's explanations are a weird disjointed grab-bag of wildly dissimilar stabs at explaining things. There is no unity or common thread in this smorgasbord of attempts at explanation. While Walter's questions were given a unified, coherent explanation, there is no such unity or coherence in the explanations offered to David's questions. 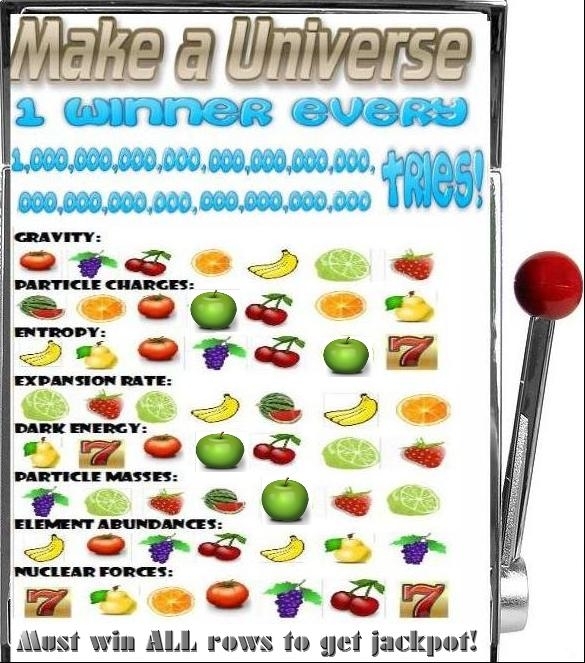 Also, two of the most important parts are non-explanations, because a multiverse cannot explain fine-tuning in this universe (as opposed to some universe), and we have never observed any visible object popping into existence out of nothing (leaving a universe popping into existence out of nothing as a non-explanation). Wife: I'm getting suspicious. This is the sixth night in a row you've come home late. Husband: I can explain. The first night I had to work late. The second night I got stuck in the office elevator. The third and fourth nights I was actually home on time, but you hallucinated that I got home late. The fifth night I was late because I got flat tires on all four tires of my car. On the sixth night I was home late because I was abducted by aliens. Of course, we would not expect the wife to believe this jumbled mishmash of an explanation, which does not involve anything a millionth as extravagant as an explanation of multiple universes or the universe randomly popping into existence out of nothing. But let us imagine a different way of explaining the items in David's list. We may suppose that there is some benevolent Creator of the universe. We may also imagine that this Creator is interested in giving humans an afterlife, which may well be a direct implication of such a creator's benevolence. Given such assumptions, all or almost all of the items on David's list can be explained in a unified, coherent way. The table below illustrates this point. The first column lists the items that David asked for an explanation for. The second column offers explanations for these items based on the assumption of a divine creator and an afterlife. The third column offers explanations for these items under an assumption of naturalism. Origin of universe Caused by a divine creator. Perhaps caused by something like a “random quantum fluctuation” in which the universe suddenly appeared from nothing. (anthropic “coincidences”) Caused by a divine creator interested in having life appear. 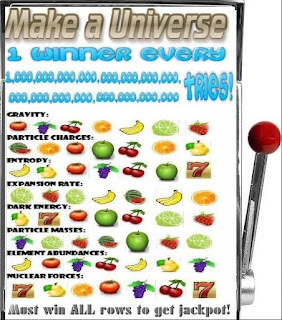 Our universe is just a rare “lucky universe” in some vast collection of trillions of quadrillions of universes. Origin of life and the genetic code An almost-miraculous event that occurred either directly through divine assistance, or because of teleological laws/factors favoring such an event (only some of which have been discovered ). Occurred through a lucky combination of chemicals, prior to the beginning of biological natural selection – kind of like throwing a box of scrabble blocks in the air and having them luckily land to spell out a long useful message. (language, spirituality, morality, self-consciousness, philosophical introspection, etc. ) Involved the appearance of special human mental abilities inexplicable through mere natural selection, either because of divine assistance, a human soul, or through teleological laws/factors favoring the appearance of such capabilities. Appeared mainly as an “incidental by-product” of random evolution, a kind of side-effect, just as gravy is a side-effect of cooking a turkey. ESP, clairvoyance, remote viewing These are indications of some higher nature of the human mind that cannot be neurologically explained, such as a human soul. All evidence for these phenomenon must be rejected, because the mind is merely a by-product of neuron activity. We must imagine a lot of fraud and countless clumsy errors by professional experimenters. Near-death experiences (NDE) Probably a sign that humans do survive death, presumably because a divine creator is interested in such survival. Near-death experiments must be hallucinations, and the similarities of the NDE accounts must be just a big coincidence. Medium activity (e.g. Leonora Piper, Gladys Osborne Leonard, Daniel Dunglas Home) These remarkable careers create no problem, because maybe they actually were communicating with the dead. Remarkable successes of some mediums must be explained as fraud, coincidence, or some combination of the two – or perhaps they hypnotized people into believing their work. Evidence for reincarnation (Stevenson, etc.) It could be some people do reincarnate, or perhaps people get information from deceased people telepathically. All evidence for this phenomenon must be rejected. Maybe fraud or conspiracies can explain this. Apparition sightings Probably occur because there is a human soul surviving death. All such evidence must be rejected, and must be explained as things like hallucinations. 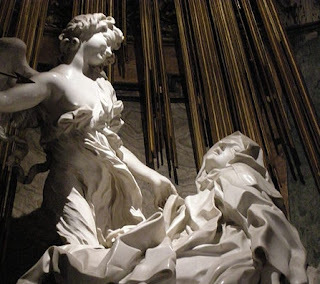 Paranormal premonitions; seemingly miraculous healing; other “miraculous” events. Could occur either through divine assistance or through the assistance of some spiritual beings (such as angels or deceased souls surviving death). All accounts of such phenomena must be rejected. Some of the more remarkable accounts might be explained by hallucinations or simultaneous mass hysteria. The column of explanations offered in the second column is far more unified and coherent than the column of explanations offered in the third column. The second column offers explanations that hang together very well, with everything being explained under the same basic assumptions. But all of the king's horses and all of the king's men cannot spin the third column into a unified and coherent explanation of the diverse items in the first column. What we have in the third column is a disjointed jumble, an incoherent hodgepodge, and a mishmash. Rod Elliot knew this was going to be like no day he had ever lived before. He asked himself: can it really be that today I'm going to meet my twin brother – the twin brother I've never seen before? It had been an astonishing surprise. He had received an email with a link to a youtube.com video. When he clicked on the link, he saw a video showing a man named Lou who looked just Rod himself. In the video Lou told the incredible story that Lou and Rod had been born as twins, but that Lou had been stolen from the hospital by a baby robber who took advantage of lax hospital security. Thirty years later the woman had confessed what happened, Lou said. Ever since then, Lou said, he had been searching to find the twin brother he had never seen. At first Rod refused to believe the story, but then he slowly realized it might be true. What was also strange were the conditions Lou set for the two of them meeting. Lou said that he could only meet Rod if Rod wrote up a thirty-page story of his life. Lou said that he was involved with a scientist, who wanted to take advantage of the unique opportunity presented by two twins separated at birth. The scientist wanted to compare the life stories of Lou and Rod, to try and figure out how much of a person's interests and life choices are genetically determined. So Rod wrote up his life story, and asked Lou by email where they could meet. Lou told Rod to come to an office on the 40th floor of an office building. At the appointed time, Rod rode the elevator up to the 40th floor, wondering how much like him Lou would turn out to be. The doors of the elevator opened, and Rod looked ahead. There ahead of him was a mirror image of himself. Lou and Rod talked for nearly an hour. Eventually, Lou had a request. Rod did as Lou requested, and then Rod asked if Lou would do the same. “What do you mean?” asked Rod. “I have everything I need for the identity replacement,” said Lou. “The identity replacement?” said Rod. “An alien race?” asked Rod in a skeptical tone. Rod finally started to look as if he believed the story. But then Lou smiled broadly. Rod said goodbye, and walked into the elevator. He pressed the button for the lobby floor. But the elevator didn't move. On the other side of the elevator doors, Lou pressed a special button above the regular Up/Down buttons. The left side of the elevator floor slid away, disappearing. Then the right side of the elevator floor slid away, disappearing. Lou heard a horrible shriek which dwindled away into silence. He didn't hear the crushing thud as Rod's body reached its final destination 40 floors below. Lou took out a handheld device and pressed a button. The long technical name of the parameter v is “the vacuum expectation value of the Higgs field.”....The value of v is a great puzzle to particle theorists; in fact, it is one of the central puzzles of physics. What is puzzling is that in reasonably simple theories v seems to want to come out to be, not 1, but a number like 1017, i.e, 100,000,000,000,000,000...As far as the possibility of life emerging in our universe is concerned, it would be a disaster for v to be 100,000,000,000,000,000. It would also be a disaster if it were 100,000,000,000,000, or if it were 100,000,000, or if it were 100,000, or if it were 100. Indeed, it would be a disaster if it were 10, or 5, or even 1.5. It would probably be a disaster if v were even slightly different from the value it happens to have in the real world. In order for life to be possible, then, it appears that the cosmological constant, whether it is positive or negative, must be extremely close to zero – in fact, it must be zero to at least 120 decimal places. This is one of the most precise fine-tunings in all of physics. If I didn't know that some physicists make enormously silly assertions about infinities of parallel universes, and ask you to believe there are an infinite number of copies of yourself, I might call the previous statement by Gleiser the silliest thing I have ever heard from a physicist. It's a statement that would only make sense if you were a robot scanning a biologically lifeless universe. Glesier provides no real scientific statements or references to back up his weird claim that there "is absolutely no evidence that our Universe is fit for life.” He merely gives a little armchair reasoning that does not hold up to scrutiny. First, Gleiser attempts to persuade us that someone reasoning that the universe is fit for life is like someone coming into a library and concluding that all of the books were made for him, or that all of the books were made for English-speaking readers like himself. But this analogy isn't appropriate, and doesn't correspond to the type of reasoning made by those who point out the ways in which the universe is fine-tuned for life. Let's imagine a scale of claims ranging from the very specific to the very general. Things are arranged in a way that benefits (or makes possible) me in particular. Things are arranged in a way that benefits (or makes possible) people who speak my language. Things are arranged in a way that benefits (or makes possible) humans in general. 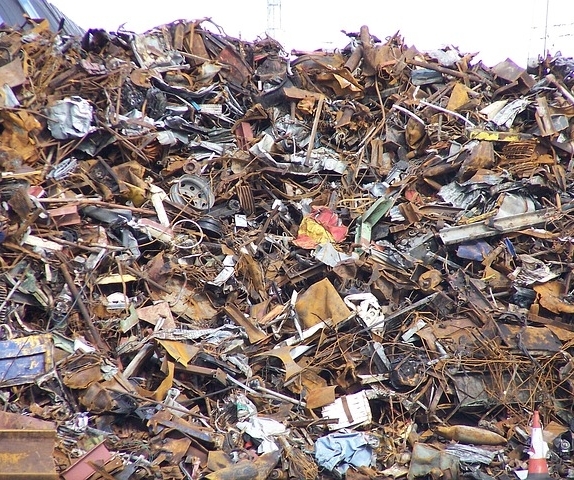 Things are arranged in a way that benefits (or makes possible) carbon-based life forms. Things are arranged in a way that benefits (or makes possible) some type of life, rather than preventing any type of life. Gleiser is suggesting that those who say that the universe is remarkably fit for life are like people who make the first assertion, or possibly the second assertion. But they are not. Almost all claims of cosmic fitness or cosmic-fine tuning involve claims like the last of these claims, claims that are extremely general and cannot be attacked on a basis of assuming an intention too specific. So Gleiser's library analogy isn't fair, and doesn't back up his claim. It's particularly weak for Gleiser to be using a library analogy to try to back up a claim of cosmic non-fitness for life (as a library consists of manufactured objects that were designed for a specific purpose). For a clever fish, water is “just right” for it to swim in. Had it been too cold, it would freeze; too hot, it would boil. Surely the water temperature had to be just right for the fish to exist. “I'm very important. My existence cannot be an accident,” the proud fish would conclude. Well, he is not important...The ocean temperature is not being controlled with the purpose of making it possible for life to exist. This reasoning does nothing to establish Gleiser's strange claim that there “is absolutely no evidence that our Universe is fit for life.” In his fish analogy he is talking about a particular organism that is adapted to a particular local parameter (the water temperature); cold-water fish are adapted to cold water, and warm water fish are adapted to warm water. But none of the main “anthropic coincidences” mentioned in discussions of cosmic fitness involve merely local conveniences, nor do any of them involve things to which the human organism or earthly life has adapted itself to. Instead, they involve things that are prerequisites for any type of life at all – and most of them involve things that are prerequisites for any type of universe with stable solid matter and stable stars. So Gleiser's little fish analogy falls flat. Again, the analogy has no relevance to the typical discussions of physics and cosmic fitness. Think of the billions, probably trillions, of barren worlds in our galaxy alone. I can't read the message “just right” for life written in so many dead worlds. Finally, Gleiser lamely asks: “If the constants of nature are so fit for life, why is life so difficult to find?” The answer is: it isn't, and it's all around us. As for looking for extraterrestrial life, we've just begun to do that, and we still haven't spent the money needed to make a very serious effort in that regard (as spending on SETI has been “peanuts” compared to what was spent on big physics projects such as the Large Hadron Collider) . Gleiser's reasoning on this topic is without merit, and I smell a very stubborn denialism in his claim that “there is absolutely no evidence that our Universe is fit for life.” Quite to the contrary, many modern physicists and cosmologists have admitted that there is abundant evidence that the universe is astonishingly fit for life. Read here for more about this topic. People keep seeing UFOs. According to this report, more than 1000 UFOs were seen in 2014 in Canada alone. But just as there are many UFO sightings, there are many web pages and web posts that aim to debunk UFO sightings. 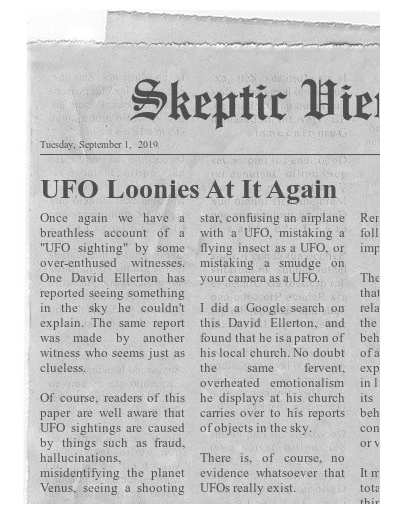 In case you might like to write one or read one yourself, I will let you know some of the top tricks of the ace UFO skeptics. The technique of total denial is a mindless technique that is often surprisingly effective. It works like this: no matter how much evidence has accumulated to suggest that some phenomenon is real, you simply declare that no such evidence exists. This technique is often shamelessly used by deniers of ESP. Ignoring thousands of published accounts supporting such a phenomenon, as well as more than 80 years of laboratory experiments, many producing extremely convincing results, a skeptic will just flatly state: there is no evidence whatsoever for ESP. The main advantage of this technique is that it can be effective if used as a sound bite. Rather than taking the time to dispute some mountain of evidence for something, which is unlikely to be very convincing, you can simply claim there is not the slightest bit of such evidence. This type of total denial is not at all fair, honest, or candid, but it often works well. This technique is widely used by modern skeptics. It works like this: given a very specific account of some paranormal phenomenon, the skeptic describes that phenomenon in a watered-down way, a way designed to make it as easy as possible to assert that the report is due to some known natural causes. When I went into the living room I saw toy bricks flying through the air. One of them hit me on the head. Nobody seemed to be throwing them. They were coming at the speed of bullets. In the same case, a constable saw a chair rising up half an inch off the floor and mysteriously moving 3.5 or 4 feet. She checked the chair for wires, did a marble test, and found nothing that could explain the movement of the chair. The account can be found at 2:08 in the video here. But when this incident is described by a skeptic trying to debunk it, these compelling details are omitted. The skeptic describes Lego blocks flying about, without mentioning them moving as fast as bullets, and without mentioning the witness saying no one was throwing them. The skeptic mentions the constable seeing the chair moving, but makes no mention of how far it moved, and does not mention that the constable checked that there were no wires attached. Carefully censoring out these compelling details, the skeptic then proceeds to argue that it was all caused by some little girls playing tricks, a theory that makes no sense in light of the details that have been censored out. Below are some hypothetical examples of under-reporting, as a skeptical debunker might use. “I saw a transparent ghost who looked exactly like my father,” she said. “It even wore my father's favorite sports T-shirt.” She reported seeing something that she associated with her father. “I had a vision of my mother getting hit by a green car,” she said. “That same day I found she did get killed by a green car.” She thought of her mother on the same day she died, before hearing of her death. 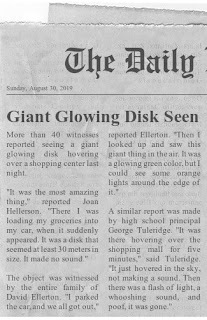 “I saw some weird flying saucer hovering over my field,” he said. “I looked at the field, and saw a gigantic crop circle.” He noticed something abnormal in his field, and he concluded that some UFO had something to do with it. This is a kind of “everything but the kitchen sink” technique used by skeptics when they don't have a good explanation for something. The smorgasbord technique consists of listing a wide variety of possible explanations, in hopes that quantity will make up for a lack of quality. For example, some one trying to explain a ghost sighting may say that it is caused by “mist, a hallucination, fraud, mold spores, drug use, hysteria, memory confabulation, vision problems, or an optical illusion.” None of these actually work very well to explain a ghost sighting, but when you make a long list a list of possible explanations, it often sounds impressive. This is one of the favorite techniques of modern skeptics, one that they often ruthlessly apply. The idea is to disqualify or discredit the witness to some paranormal phenomenon. One crude application of the technique is to accuse a witness of being a fraud or someone who is hallucinating. Or, being a little more subtle, the skeptic may try to insinuate that the witness is some zealot or enthusiast whose account cannot be trusted because it reflects some emotional state of the witness. If all fails, the skeptic tries to insinuate that the witness is crooked, confused, crazed or “carried away” by some emotion. Now let's look at an example of how these techniques might be used. Below is a hypothetical account of a UFO sighting. Now here is a typical way in which a modern skeptic may try to debunk such a report. I can identify some of the sleazy tricks used in the debunking above. One trick is under-reporting (technique number 2 discussed above). 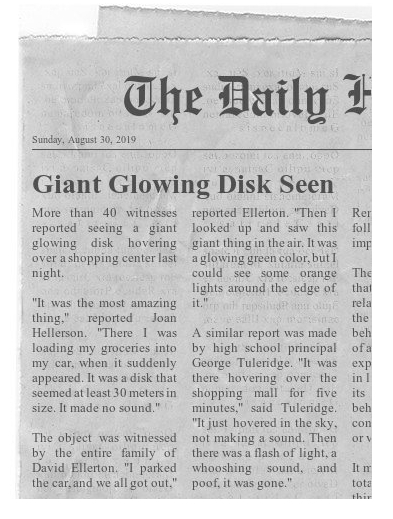 The original report discussed compelling details such as a giant flying disk, as well a sighting by more than 40 witnesses. But these compelling details are censored from the skeptic's account of the incident. 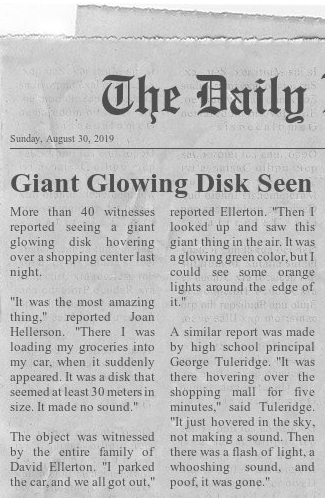 A sighting of a giant disk seen by 40 witnesses is under-reported, described as merely “seeing something in the sky he couldn't explain,” and described as if it was seen by only two witnesses. Another trick used is the smorgasbord technique (technique #3 discussed above). 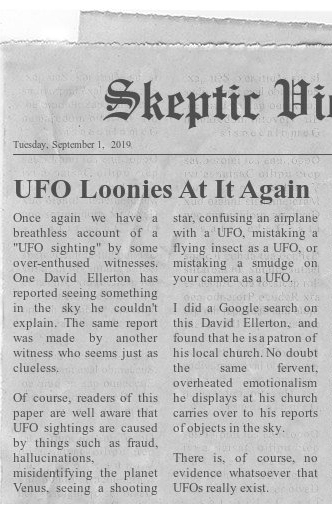 Lacking any good explanation for the reported sighting, the skeptic throws out a wide assortment of possible explanations, without explaining how any one of them can plausibly explain the sighting in question. Still another trick used is the “attack the witnesses” technique (technique #4 discussed above). 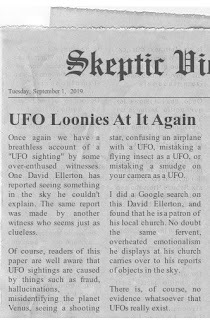 Apparently lacking any good basis for discrediting Ellerton as a witness, the writer makes a crude attempt to suggest that Ellerton's report cannot be trusted because he is religious. Think that skeptics rarely engage in attacks this crude? Try reading wikipedia.com, where this is done frequently. The final trick used is the “total denial” technique, in which the writer brushes away six decades of inexplicable UFO reports by asserting that there is “no evidence whatsoever” that UFOs exist. This UFO report and its skeptical rebuttal are hypothetical, but the argumentative techniques described here are really used, and used abundantly. Beware of them. 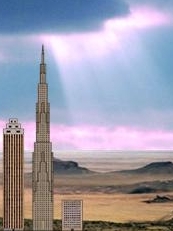 A few days ago this blog had a post called Mars Peril, a science fiction story that dramatized the danger of cosmic rays in a manned mission to Mars. But there may be an even greater danger to a Mars mission: the danger that it simply won't be very viable entertainment. Some purists will immediately ask: what difference does it make how entertaining a Mars mission is? But entertainment has always been a very large part of the purpose of manned space exploration, although not a very commonly acknowledged purpose. Realistically, one of the top three reasons we do space exploration is because of its entertainment value. Other top reasons include national prestige and satisfying the funding desires of an entrenched bureaucracy, so that its employees don't have to get other jobs. Science is basically a distant fourth in manned space exploration. It seems that space travel had the highest entertainment “bang for the buck” in the early days of the Mercury program. When the first astronauts were sent into space, space travel was pretty much “the greatest show on Earth.” Part of the reason was that it didn't have much competition. There were no personal computers or internet, and the television shows of the early 1960's were something of a vast wasteland. So when the first men were launched into space in the earlier 1960's, it seemed every American was gripped by the spectacle. It was the perfect recipe for mass entertainment: extreme danger (no one knew whether the first manned rockets would blow up on the launching pad) ; short missions lasting less than a day (too short a time for watchers to get bored); and opportunities for photos that no one had ever seen before. There was also great excitement during Apollo 11, the first mission in which astronauts walked on the moon. But then a strange thing happened. People began to get very bored with the Apollo missions. With the exception of Apollo 13 (which never landed on the moon, facing an explosion that nearly killed its astronauts), the rest of the moon missions seemed rather boring to the average American. The TV ratings plummeted. Very soon Americans were screaming at their TV screens: dammit, not another moonwalker on my TV, I wanted to match my soap operas and quiz shows today. What can we expect regarding the entertainment value of a Mars mission? Based on what happened during the Apollo missions, and other factors I will explain, I think that the average person may not watch television coverage of a manned Mars mission for more than about 2% of the days that it operates. Surely the TV ratings will be very high when the astronauts first blast off into space. But then the astronauts will go on a long, dull trip to Mars that may take between 3 months and 9 months. Almost no one will tune in to see the astronauts during this time, just as almost no one watches the astronauts in the International Space Station. 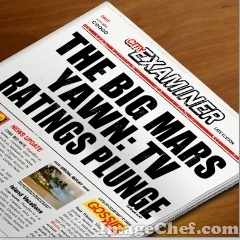 The TV ratings will rise again when the astronauts go into orbit around Mars, and land on the planet. The first exploration of the Mars surface will no doubt be watched by hundreds of millions. But I predict that the TV ratings will then plunge. People will quickly grow bored by watching astronauts walk around on the surface of Mars, just as quickly as they grew bored by the sight of astronauts walking around on the surface of the moon. One of the reasons is quite obvious: the surface of Mars simply isn't very interesting, as it lacks any visible form of life. As for the long return mission to Earth, that will be an even worse TV ratings disaster than the trip from Earth to Mars. There will be a spike in the TV ratings when the astronauts finally return to Earth. So let us imagine a 6-month trip to Mars, with two months of exploration, and a 6-month return. That would be 425 days. The average American would probably only pay close attention on five of these days: when the astronauts leave Earth, when they first enter into orbit around Mars, when they land on Mars, when they first walk around on the surface, and when they return to Earth. Even if you allow three additional days for watching astronauts walk around on the surface, it would only amount to 8 watching days out of 425, or only 2% of the total mission. Part of the problem will be competition. Ask yourself: why do you not go to the NASA web site, and watch live web cams of the astronauts in the International Space Station? Part of the reason is: when you have free time, there are 500 other things you can do, some of which are a lot more entertaining. You have a choice between watching hundreds of cable TV channels, or viewing thousands of fascinating web sites. Or you can play any of thousands of exciting interactive games on your gaming console. It's so much different from the days of the first manned space missions. Back then the average person only got three TV channels, and the three TV networks took over the airwaves during the space missions. So during a space mission in the early 1960's, your choices for entertainment were something like (1) read a book; (2) play a board game; (3) listen to a phonograph record; or (4) watch the space mission on TV. But now if you follow a space mission on TV or on the web, you are choosing only one of thousands of exciting entertainment choices. Given this competition, the entertainment value of a manned space mission dwindles. By the time a manned space mission to Mars takes off, the entertainment competition will be even greater. Just to give you a taste of coming attractions, according to this New Yorker story, game developers are working on a title called No Man's Sky which will supposedly let virtual travelers “explore eighteen quintillion full-featured planets.” By the time a manned Mars mission launches, there will probably be a first-class virtual reality system used by millions of people. Even 99% of space enthusiasts may prefer to “walk around” virtual life-bearing planets using virtual reality headsets, rather than just watching astronauts walk around a planet with no visible signs of life. It may be argued that a certain percentage will always prefer to observe reality rather than virtual reality. But even in the “real science” department, a manned mission to Mars will face stiff competition. By the time such a mission launches, the James Webb Telescope will be in business, offering breathtaking new images of deep space every day. There will also be countless other exciting scientific breakthroughs, if anything remotely close to the “singularity” occurs. Such breakthroughs may include finding life on planets revolving around other stars. We can imagine a science enthusiast checking the science news while astronauts are exploring Mars. Such a person might give merely a glance to the Mars results, and spend 95% of his science reading time looking at scientific discoveries far more interesting than the exploration of a planet with no visible life. Some might argue that people will be fascinated by the exploration elements of a Mars mission, by the “finding what's over the next hill” element of it. But the exploration of a particular area of Mars is unlikely to have many visual surprises. The surface of Mars has already been thoroughly radar-mapped and photo-mapped. You can download “terrain files” that allow you to virtually fly over any part of the surface of Mars. So we pretty much know what astronauts are going to find when they explore some particular area. We can imagine people saying they don't even want to watch the live TV coverage of a Mars mission because they have already “been there, done that” using their virtual reality system. Near death experiences (NDE) first came to public light in the 1970's with the publication of Raymond Moody's book Life After Life. Patching together elements from different accounts, Moody described an archetypal typical near-death experience, while noting that most accounts include only some elements in the described archetype. The archetype NDE included elements such as a sensation of floating out of the body, feelings of peace and joy, a life-review that occurs very quickly or in some altered type of time, a passage through a tunnel, an encounter with a being of light, and seeing deceased relatives. A previous study on near-death experiences was published in the British medical journal The Lancet in 2001. The study interviewed 344 patients who had a close encounter with death, generally through cardiac arrest. 62 of those reported some kind of near-death experience. 15 reported an out-of-body experience, 19 reported moving through a tunnel, 18 reported observation of a celestial landscape, 20 reported meeting with deceased persons, and 35 reported positive emotions. More recently the AWARE study found some fascinating similar results, discussed here. Some scientists have done experiments trying to shed light on near-death experiences. Back in 2014 we had the paper “Surge of neurophysiological coherence and connectivity in the dying brain,” which was widely reported on by the press. But this was much ado about nothing, for this skimpy little study really did nothing at all to throw any light on near-death experiences. The study did not involve human subjects, but merely involved rats. The scientists killed 9 rats who were connected to EEG machines that measure brain waves. The results, as show below, were not at all surprising: the brain waves quickly died out, reaching a very low level at about 17 seconds, and flat lining entirely by 30 seconds. Trying to jazz up these dull-as-dishwater results, the scientists tried various minute statistical analytics to extract something that would be relevant to near-death experiences. Their data does not at all justify the title of their paper. 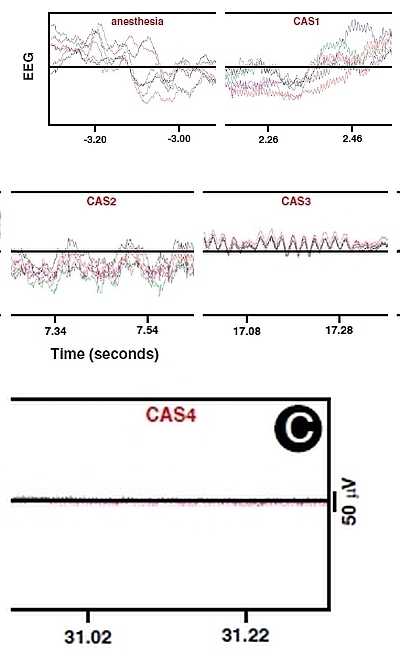 They did not at all discover a “surge of neurophysiological coherence and connectivity in the dying brain.” To the contrary, their data shows brain activity very quickly dying out after the cardiac arrest of the rats they were studying, sharply declining by 7 seconds after the cardiac arrest, declining to very little at 17 seconds, and reaching nothing at 30 sec. 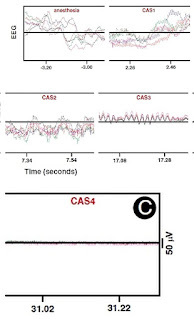 They did not detect, on average, any spike in brain waves following cardiac arrest. An accurate title of their paper would have been Brain Function Very Quickly Disappears When Rats Die. I may also note a few other points. First of all, it makes no sense to claim that a few seconds of brain activity could somehow correspond to what is reported in near-death experiences, since such accounts are elaborate accounts corresponding to at least several minutes of experience. Secondly, the sample size of the experiment was so small that no reliable conclusion can be drawn from it, because they only tested 9 rats. With a sample size that small, one can have little confidence in any results (just as asking 9 pedestrians whether they have cancer does not give a reliable indication as to how common cancer is). Recently another study was released which has been touted as being relevant to near-death experiences. It has been called a follow-up of the previous study, but followed the same skimpy approach, using only 9 rats. Scientists killed 9 rats, and detected the release of more than a dozen neurochemicals. This result is trivial. The brain is releasing neurochemicals every minute. This is a most dubious speculation, and this claim of a “high likelihood” is unwarranted. There exists no proof that a short-term surge in neurotransmitters causes hallucinations, nor does there exist any evidence that any type of trauma can cause a visual hallucination within a few seconds, as would be required for hallucinations to produce near-death experiences after a cardiac arrest. It is widely believed that the electrical shock treatment called ECT produces a surge in neurotransmitters, but such treatment does not produce hallucinations. What is the cause of hallucinations? Scientists don't understand this. As a medical doctor states here, "The cause of hallucinations is unknown." The fact that neurotransmitters may spike at death does nothing to suggest that such neurotransmitters are causing hallucinations in conscious organisms. The brain can continue to release neurotransmitters even after consciousness is lost. A previous study found that neurotransmitters increase in sheep which were killed by throat cutting. Evidently a spike in neurotransmitters can occur in completely unconscious organisms. Would we have any sound basis for concluding that these sheep hallucinated when their throats were cut? No, we wouldn't. And to claim that such sheep had a "high likelihood" of near death experiences would be not merely unwarranted, but ridiculous. There are two general reasons for rejecting any hallucination hypothesis to explain near death experiences, whether or not that hypothesis involves neurotransmitters. The first reason is the time factor. Near-death experiences often occur in people who undergo cardiac arrest, something that should cause a quick loss of consciousness. In such cases there simply is no time for a substantial hallucination. People who have heart attacks don't go through a few minutes of raving that might correspond to hallucinations, and then lose consciousness. Instead they quickly have a heart attack and lose consciousness very soon thereafter. The second reason is that visual hallucinations produce random imagery, but the imagery in near death experiences is typically not random. It tends to have a few common themes like the themes mentioned at the top of this post. This common pattern is not what we would expect from hallucinations. In the same vein of misguided experimentation, some scientists rigged up some elaborate perceptual trick involving an MRI scanner and cameras to fool people into thinking their body was located somewhere in the room elsewhere than it was. They then found that a part of the brain called the hippocampus lights up during such an experience. This silly study is being trumpeted as an explanation for the out-of-body experiences reported as part of near-death experiences (and in other cases also) – “your hippocampus causes it.” But such a study shows nothing of the sort, simply because you cannot explain a reported phenomenon by creating some special experimental situation totally different from the situation in which the phenomenon was reported. People having near death experiences and out-of-body experiences don't have them in anything like the weird hi-tech setup that was used in this experiment. I may also point out the whole “this brain part lights up when x occurs, so that brain part causes x” line of reasoning is generally bunk, as pointed out in the book Brainwashed: The Seductive Appeal of Mindless Neuroscience. My suggestion to scientists who want to learn more about near-death experiences is to actually work with the people who have such experiences. Don't waste your time rigging up goofy camera configurations that don't match actual human experiences, and don't waste your time killing rats or cutting the throats of lambs.